Team Smith: Happy Birthday to Me!!! What's a birthday without cake and candles. This little monkey got it all. We had a great time at her little party at home. She had already had a party with her friends so it was just me, Joe, and Papa Ron singing to the little lady. She is a great little smiler and actually looks half was decent for this pic. Her grimace isn't as bad as it usually is. 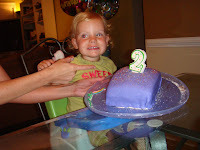 We had strawberry cake covered in purple (her new favorite color) marshmellow fondant. She had a blast serving it up. Something about this kid and knives...she's a nugget. 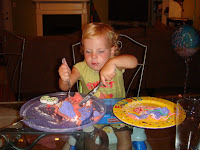 But after we all had a piece she decided to go all culinary on us and made quite a mess. Her Majesty was served on her Sierra Birthday plate that I made last year and I love it! So cutie! 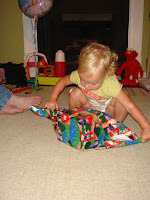 After cake it was presents time and for us it meant an hour of watching Sierra rip little pieces of wrapping paper off all her presents and handing them them to me one by one. It was awesome and I loved it! 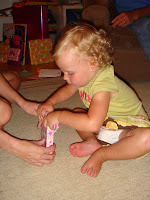 I loved watching her open the photo albums I FINALLY put together for her. 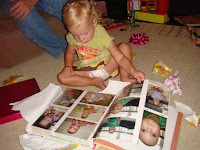 She LOVES looking at pictures of herself and we went through two books to showcase all the highlights of her first year of life. We look at them everyday and talk about all our fun times. 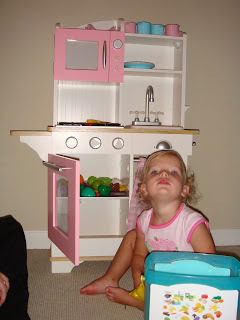 Her big gift for her 2nd Birthday was a little kitchen for her room. Awesome! Awesome! Awesome! Joe spent hours putting it together and Si just loves this thing. It's awesome! Her Grampy hooked her up with plates and cups, silverware, and 99 pieces of the best plastic and cardboard food product out there. 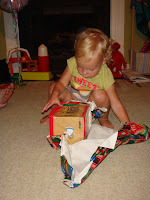 She loves this thing! The microwave is her favorite and she stashes all the food in the oven. She serves us drinks and shares the hot dogs with us. It is priceless! She is priceless and I'm loving this baby of ours. She's so cool!